I’d like to begin this review of Glimmerglass, if I may, by talking about a different book entirely. Aside from being a work of long-form science fiction poetry, Thaliad is notable for the sometimes playful, sometimes even profound ways it interacts with literary history. Not only does its title invoke Classical epics, but its structure echoes that of The Iliad, and the poem itself is replete with nods to Greek tragic drama in its plotting, its wordplay, and the frequent allusions to masks. Added to this are references to myriad other writers, from Ovid and Marvell to William Golding and Diana Wynne Jones. The rationale behind all of this is that the poem’s narrator—living many years after the events she describes—has learned her trade as a poet-historian by plundering what remains of the world’s ruined libraries, supposedly giving herself a sort of potted knowledge of literature. Thaliad, then, addresses the problem of overcoming the apocalypse through an act of textual, rather than material, salvage; the world’s history is reconstructed via this filter of Classical literature, and our pre-apocalyptic civilization is mythologized and made strange. The result is that the tired science fictional staple of the post-apocalyptic narrative is re-imagined by Youmans in terms of a much older literary tradition, and as such is reinvigorated. This generates some fantastic tensions between, for example, the forward-looking future setting, and Youmans’s New Formalist approach to traditional poetic metre. It’s a remarkable achievement. Whereas Thaliad engages with the Classics, Glimmerglass’s literary concern is fairytales and myth. It’s not a reworking of any one particular fairytale, but it revels in the forms and idioms of the genre. On the surface it’s a real-world drama about a woman’s later-life discovery of adventure, love, ambition, and artistry. In light of its concerns for both coming-of-age and the real rubbing against the magical, it’s fitting that much of the work is given over to images of thresholds being crossed, of locked doors being opened, and of rivers overflowing their banks. And while it’s a literary-critical truism to remark that the source material of many fairytales is much darker than their popular Disney-fied incarnations, Glimmerglass really is an adult fantasy, not in the sense that it’s violent and sexual (though this is an aspect of the text), but in its emotional complexities, and its themes of loss and redemption. It’s brilliantly well-written, shockingly raw, and transportingly—sometimes confusingly (but not in a bad way)—weird. The novel is about Cynthia Sorrel, a failed painter in late middle-age who relocates to the fictional village of Cooper Patent on the edge of Lake Glimmerglass, which, research tells me, is James Fenimore Cooper’s alternate name for Otsego Lake in New York State. “Glimmerglass” is also where the children of Thaliad settle to weather the apocalypse, giving nerds like me the tantalising suggestion of a shared universe (my initial idea for this review was to contend that Glimmerglass is a direct prequel to Thaliad, but such an argument would require more exposition than I, and I imagine you, have patience for). As Cynthia settles into village life, we’re introduced to a supporting cast of characters who, while whimsical and superficially happy, are soon revealed to have complex and upsetting pasts. Iz Hix bears the scars of an horrific car accident, “They had to pick the spikes and pins of glass out of her face” (p. 139); Andrew Wild is so hurt by the death of his wife that he has “promised [him]self, never again” (p. 67), and the mystery of his cousin, Moss—who disappeared decades ago—still preoccupies the villagers. Cooper Patent offers the promise of rural escape, both idyllic and wild, but underneath this attractive facade is a labyrinth of mystery and emotional darkness; “we’re always lost” (p. 104), says one of the villagers, tellingly. You’d be forgiven for believing that what I’ve just described is closer to mimetic literary realism than anything supernatural or fantastic. It’s true that Glimmerglass is a fantasy sans what Ursula Le Guin has recently called the “surface elements” of the genre (dragons and wizards and etc. ), and even in the novel’s final third, where things do get stranger, there’s a sense of ambiguity and haze (more on this later). Instead Glimmerglass performs genre in more subtle ways. Firstly there’s the language (and what beautiful language it is), which speaks about the everyday in the estranging-yet-familiar terms of fairytales. Cynthia’s past pains are a “poisoned apple” (p. 12), she refers to her new lover as a “wolf of the forest” (p. 116), she lays “Hansel pebbles” (p. 135) when she’s lost, and her cottage is “like a moated castle” (p. 73). As befits Cynthia’s vocation as a painter, the descriptive focus is primarily visual, the landscape most often described in terms of colour and light. Augmenting this is Youmans’s proclivity for rhyme “Marian—the child bride—she died, you know” (p. 26) and prosodic rhythm “She lost her foot at forty and then her leg to the knee” (p. 26), which lends the work the aura of a dark nursery rhyme. “Have three.” Andrew passed the tray of sweets. “I couldn’t,” she said, but took a piece of shortbread. But this stylistic appropriation of fairytale language isn’t the only way that Glimmerglass engages with the fantastic. 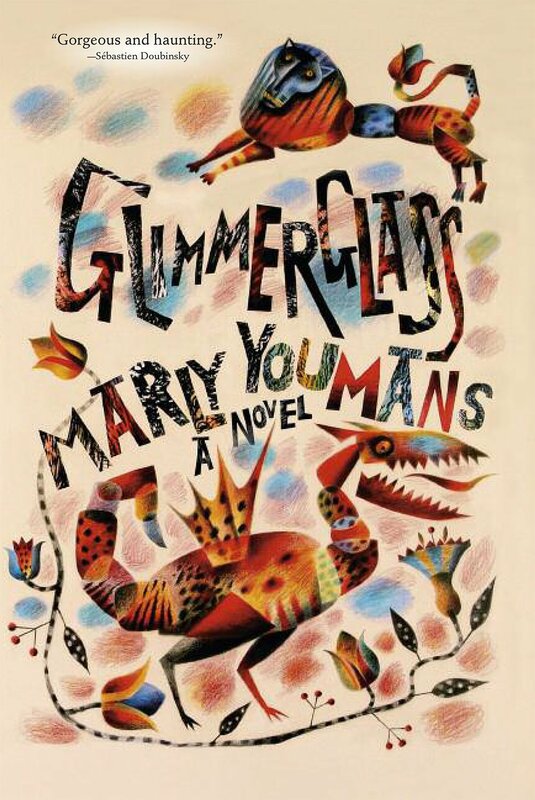 If the language teases the reader with the expectation of traditional fantasy, then the book’s plotting is something more complex; a suggestion of the supernatural, as if Glimmerglass has one foot in the real, and the other down the rabbit hole. Soon after Cynthia arrives in Cooper Patent, for example, she glimpses the figure of a naked adolescent in the woods that surround her house. The boy becomes her muse and triggers a surge of creativity, pushing Cynthia to levels of painterly achievement she thought were beyond her. There’s a plurality of possible explanations for this vision, from the prosaic (a trespasser on her land), to the psychological (a hallucinatory manifestation of Cynthia’s frustrated sexual and artistic desires), to the gothic (a ghostly apparition of the boy who went missing years earlier), all of which are, in some way or another, justified by the text. And this is just the tip of the iceberg. As the narrative progresses, Youmans piles wonder upon mystery upon marvel, picking up the momentum until the novel’s final act, an intense Alice-In-Wonderland-like journey “inside the hill,” a beautiful other-place populated by “shadow” versions of Cooper Patent’s residents: manifestations of the village’s darkest emotions, repressed desires, and buried anger. One of the figures, “Our Lady of Pain,” resembles Iz Hix, but skewered with millions of needles in a striking visual expression of the ongoing pain caused by her car accident. As I’ve intimated above, though, all of this fantastical stuff is ambiguously deployed. Cynthia’s travels into the hill could be nothing more than a sickness-induced fever dream. Personally I think you’d have to be pretty bloody-minded in your exegesis to argue that all of the book’s weird events have material-realist explanations, but the option is there if you really must. Glimmerglass shimmers on the boundaries of the real and the unreal, of poetry and prose, of the ordinary and the fantastic. It’s down to the caprice of the individual reader, therefore, to decide exactly what sort of story it’s trying to tell. Maybe the whole thing is a fantasy of Cynthia’s (sub/)conscious devising? A way to cope with the failures of her early life, and to claim some of the magic she never found. The novel explicitly states that Cynthia has a propensity to alter her own memory and insert “something fantastic into the world” (p. 43). Maybe your literary inclinations tend towards the fantastic, in which case, if you want it to be, Glimmerglass is fantasy dialled up to eleven. Or maybe you prefer a magical-realist middle ground? It defies easy classification. It’s an incredible balancing act. Of course there’s potential for the quasi-fantastic to bathetically undermine the seriousness of Cynthia’s emotional narrative, but so controlled and deft is the author's handling of both the fantastic and the naturalistic that it’s very rare that one aspect ever gets in the way of the other. The discovery of a much-sought-after key lying on a hillside is a bit too serendipitous for my liking, and Youmans’s tendency to explain her own symbolism is an occasional weakness, “There was a small red birthmark in the shape of a droplet close to his hairline [ . . . ] Was it prophetic of blood and tears?” (p. 104), but these are minor niggles against a novel that’s otherwise without flaw. Which all brings me, in a roundabout sort of way, back to my original point: that of stories being renewed and changed by their retelling. Glimmerglass is, at its heart, a fairytale, re-cast as a late-life coming-of-age drama. Cynthia could be Snow White or Cinderella deferred by thirty years. Through her, Marly Youmans is challenging the stereotypical fairytale narrative that adventure, magic, and wonder are experiences exclusive to youth. Cynthia is middle-aged, but she is only just realising her potential. It’s refreshing that the character who’s finding her courage, falling in love, and chasing monsters through dark woods is an older woman. Perhaps this speaks to the paucity of such characters in fantasy—and fairytales specifically—where women’s aging is so often associated with acrimony: bowed witches whose ugliness, evil, and spite is directly related to their bitterness over faded youth. In a sense Glimmerglass, while being a very different sort of book, achieves a similar effect to Thaliad. The latter uses its genred (i.e., post-apocalyptic) conceits to examine the end of childhood innocence, whereas Glimmerglass deploys the fairytale as a way to talk about a late-life return to wonder and adventure. They’re both works of genre, but they swim against the tide of what those genres traditionally represent. In Youmans’s work genre artefacts are more than just window dressing used to embellish or make-cool otherwise naturalistic narratives: the fantastic is inseparable from her metaphoric and thematic intentions. The challenge of her work is in the way it encourages readers to hold in their minds often contradictory ideas (childhood with apocalypse; age with the fairytale; fantasy with reality), while simultaneously resisting rigid approaches to genre taxonomy. It’s a Gordian knot of intertextuality, in which signs and symbols are dislocated from their familiar contexts, made strange, reorganized. It’s recognizable and it’s new at the same time. It’s difficult to overstate the emotional effect that Glimmerglass has had on me. This is a beautiful, complex, moving book. Marly Youmans’s prose flows like clear water, and every image is, as Cynthia observes, “full of meaning” (p. 39). Tom Atherton is a blogger from Wales, probably best known for co-writing the literary deathmatch fan fiction website "Could They Beat Up China Miéville?" He tweets at @Tomcat_Redroom.